Lithium ion micro-batteries (LIMBs) are currently regarded as a highly competitive candidate for on-chip energy storage, due to their properties of large voltage window, lightweight and high energy density. Some significant advances have been made in planar LIMBs, however, the developing of planar integrated LIMBs with satisfied flexibility, high-temperature performance and modularization has not been achieved yet. A research group led by WU Zhongshuai and BAO Xinhe et al from the Dalian Institute of Chemical Physics (DICP) of the Chinese Academy of Sciences reported a prototype construction of all-solid-state planar LIMBs, with the characteristics of superior volumetric energy density, exceptional flexibility, extraordinary high-temperature performance, and outstanding integration of bipolar cells. The LIMBs were based on interdigital patterned films of carbon-coated lithium titanate (LTO) nanospheres as anode, and lithium iron phosphate (LFP) microspheres as cathode, which were free of polymer binder and separator, working in ionogel electrolyte. The interdigital LIMBs were fabricated via layer-by-layer mask-assisted deposition of graphene (EG) and electrode materials (LTO and LFP), without metal current collector, additive and polymer binder. The resulting patterns of micro-electrode films showed outstanding uniformity, mechanical flexibility, high electrical conductivity. The resulting LIMBs deliver ultrahigh volumetric energy density, ultralong-term cyclability without capacity loss after 3300 times at room temperature, and outstanding rate capability due to the multi-directional Li-ion diffusion mechanism. Furthermore,the micro-batteries present exceptional flexibility without capacity decay under repeated bending, remarkable high-temperature performance up to 1000 cycles operated at 100°C, superior miniaturization and simplified modularization of constructing intergrated LIMBs that readily control over the output voltage and capacity. All of these cannot be simultaneously achieved by the conventional techniques. Therefore, the planar LIMBs hold tremendous opportunities for future miniaturized and integrated electronics. 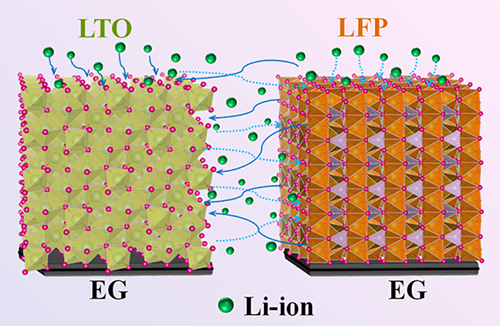 Their study entitled "All-solid-state planar integrated lithium ion micro-batteries with extraordinary flexibility and high-temperature performance" was published online in Nano Energy.